First of, a big gold plated disk to the Olympics for being over. I never quite know how to feel about myself and my country for two weeks every four years. First of all, I get so tense; I realized that I had to stop watching when I found myself sitting at my desk crossing not only my fingers, but also my toes and facing a strange urge to curl up into a small ball for luck (it is hard to hide the fact that one is streaming figure skating in the middle of the work day when one is hunched over in strange positions at one’s desk). In general, I am not a big fan of nationalism and feel that patriotism taken to an extreme can be dangerous. Yet, during the Olympics, I forget about all of those things and do not even consider rooting for the underdog or questioning any of the deeper political implications of resource use or host country politics. It is good to take a break and enjoy sports sometimes, and I did, but it is now time to go back to regular life. A large medal goes to a coworker who has a farm in the department of Boyacá and often brings in fruit to share. 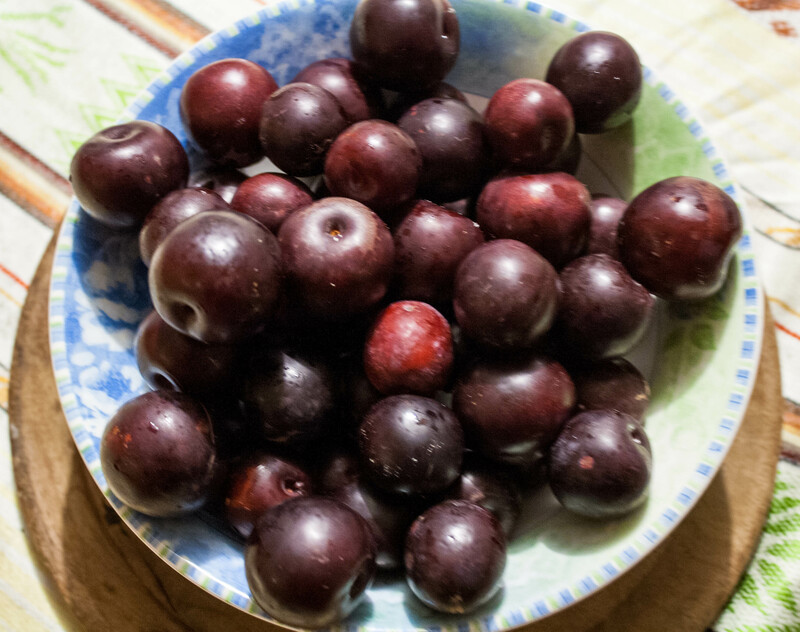 I probably ate 25 plums at work and brought a giant bag full home. I will also award a medal to the Parkway for putting in handicap access sidewalks on every corner. It is still hard to navigate the middle of some sidewalks, but this is a patch of concrete in the right direction. I have been feeling a little overwhelmed by the news in Colombia this week. Here is a medal to Semana magazine for uncovering not one but two scandals this month. Negative medal or at least multiple minus points to the military for spying on all involved in peace negotiations and general all around corruption, including multiple ties to paramilitary groups and false positives. Negative points of course go to the assassins who attempted to kill Aida Avella on Sunday, a presidential candidate who has returned to the country after 17 years in exile after almost all of her political party, the Union Patriotica, was wiped out in what many call a political genocide. Once again, questions are raised about the possibility of political participation of the FARC and the need to actually address roots of conflict. Lack of space for political particpation is part of the reason many fighters went to the “montes” in the first place; death threats and attempts do not make the decision to leave any easier. Therefore, I would like to give all peacebuilders and civil society organizers a large quantity of medals for their unrelenting work in a difficult context. I have the ability to leave when things get hard but even when the number of human rights defenders who are targeted increases, civil society in Colombia continues to call and work for peace. Chris Kimball and the whole gang at America’s Test Kitchen. Despite the bow tie, this avid Vermont cheese eater somehow manages to provide me with hours of entertainment, without having to lift a spoon. Sometimes, after a long day at work, there is nothing better than watching other people cook. The next best thing would be eating it, of course, but I am taking baby steps. Justapaz for finally allowing me access to the website and the facebook page! Please like us. Nelson Mandela always gets a medal. Here is another one for what he may have said to Colombia as it seeks to move into peace. 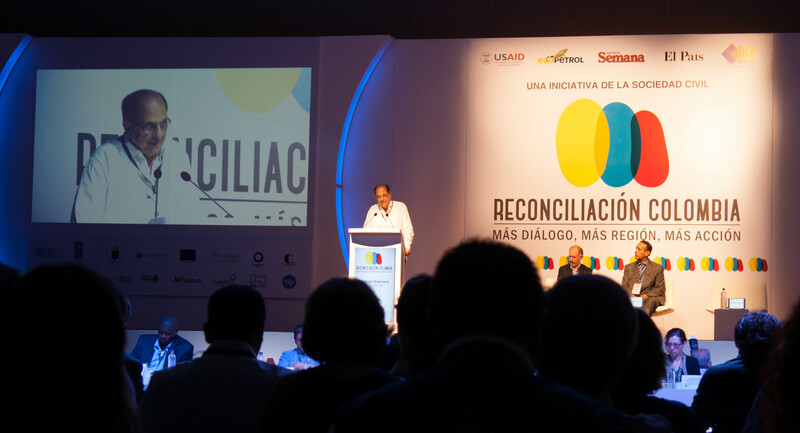 I would also like to give a medal to the new Reconciliation Colombia program, an initiative of civil society that brings together political figures, business and social organizations to talk about the difficult task of reconciliation, as well as sharing stories of reconciliation in action. We spent all day yesterday in a forum and it was neat to see the beginning of hopefully a new emphasis on the need for reconciliation along with practical ideas of what that could like in day to day life. Like with any new idea, there is lots of room for improvement especially in the methodology of the forum and the need for a gender balance, among other things, but it is still exciting to see people who have a tendency to view the other as an adversary seated together and discussing the building of their country in the same space. Here is where I want to give a medal to life for bringing me here, to this place where I can talk about reconciliation, Colombian politics, development and peacebuilding. I am not an expert, but when I look back to when I first arrived in Colombia, I have learnt so much and am grateful that I can now somewhat participate and understand what is going on around me. There were spaces of extreme boredom yesterday in the forum (and sometimes in my job in general), but I felt at moments overwhelmed with gratitude to at least be able to participate, with Colombian coworkers, in activities and themes that excite me even when I feel cynical, something I could not have imagined just a few years ago. There is so much happening in Venezuela and it can be hard to find nuanced information that does not stick to the old binaries of left versus right. I would place the Washington Office on Latin America blog as a medal contender. These walkers,who travelled for two months from Attawapiskat on Jan. 4 to walk more than 1,700 kilometres to arrive in Ottawa to raise awerness about treaty rights. 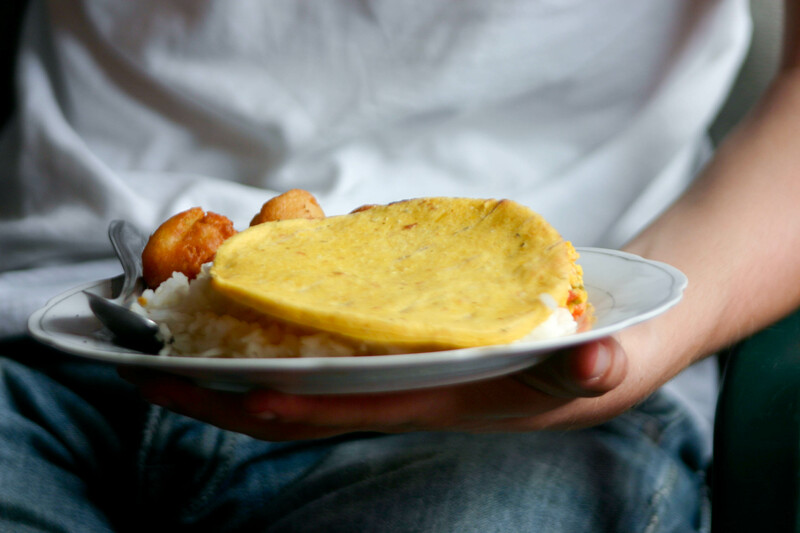 Arepas. Whether deep fried with an egg inside, fill with corn kernels and cheese, sweetened or simply served on the side, these cornflour disks are a gold medal all in of themselves. Who would you like to give a gold medal to this week? And talking of Nelson Mandela, I understand he offered his assistance to the possibility of peace negotiations in Colombia in the past – Ex-president Uribe’s response – a curt ‘no thanks’. I had no idea! That is fascinating, but the response of Uribe is not so surprising. Thanks for sharing.